I have a secret…but I totally trust you. I know it’s between us. It’s…hard drives. And that’s not a euphemism. I love them – all sizes, brands, I never discriminate. But I recently made my first portable purchase, the Western Digital My Passport Essential 320 GB USB 2.0 Portable Hard Drive (in Intense Blue!). The lure of taking my iTunes songs and apps with me was the initial reason, although I’ve started a daily backup of current active files which are transferred to my weekly full backup (on a LaCie Porche Drive) and my monthly full disk backup (WD My Book 500 GB). I also bought a case, which carries the drive and cord, my aircard, headphones, a thumb drive and my iPhone connection cord. All neat and clean. Of course, like all good addicts, I’m already planning my next hard drive purchase, which is a 1TB Apple Time Capsule (I see it as the final – Really! – purchase). Then I set up Time Machine and I’m done. I’ve been working with crayon for just over two months now. It’s been a significant change for me from before – not the least of which is working from home. At crayon we use a number of web-based tools to stay organized and also to keep in touch – many I’ve talked about on this blog before. * Basecamp – we use it for project management and have just started to share with our clients. It took a full day to reorganize the existing account when I started – I also put together a couple of screencasts for our team to learn how to use it. I’m also planning to do a couple for our clients so that they feel comfortable using it. * Backpack – we use this as our own intranet. Anything internal (not project-based) goes here. This has been really successful in terms of adoption – everyone has been adding to pages as well as adding their own. * Highrise – we’re using this for our CRM solution and to track our new business process. As of right now, only the crayonistas involved with new business have access. * ooVoo – (disclosure – ooVoo is a crayon client). We use ooVoo for text and video chat throughout the day to keep in touch. I’m looking to incorporate Campfire instead – less interruptions, more work. * Google Docs – we share docs that we use as a company – status reports, contact lists, etc. * iPhones – most of us at crayon have iPhones for use on both Macs (me) and Windows (everyone else). I’ve written up for the team how to get our 37signals apps on the home page as well as the different productivity apps I test/use. * Twitter – we love Twitter. Most of us are using it regularly, the other are just starting to add it into our workflow. Each of us seem to have very different networks for the most part, as well as some overlap. These are the tools we use at crayon everyday. With a virtual company – communication and organization takes on even more importance. These services work for us today, and as a lot of these are new to everyone, it’ll take a bit of time for complete adoption and the level of comfort that I have – something to keep an eye on. It’s been almost 2 1/2 months since Apple’s AppStore debuted (and I upgraded my first gen to a 3G) and I’ve been testing out and using a number of different applications. The Productivity section of the AppStore easily had the most applications the first day and it has continued to grow steadily. I had been a part of the OmniFocus beta test group and it was one of the best testing experiences I’ve had. A great group of people, starting with Ken Case and the whole development team – all of whom were really responsive and excited to be working on the application. 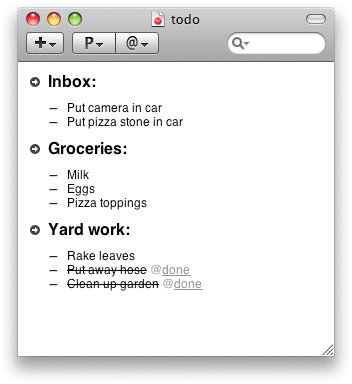 So I was excited to see that OmniFocus would be available for the iPhone the first day. The iPhone version is great – especially as it used the 3G location services so effectively. Put together a shopping list and OF shows you the closest store to your current location. It still has the same capture features as the desktop app and you can take pictures, enter text and make voice notes quickly. And it syncs with the desktop version. Very intuitive and comprehensive – also a bit too much for me. But I truly love this company and it’s products. 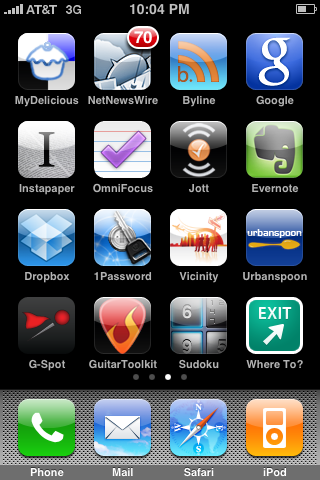 Another iPhone application I use frequently is Jott. I’ve been a Jott user for awhile and they finally exited their beta period and have a number of tiered pricing options to choose from. And a well-featured free account, which works well with the iPhone app. I use Jott to quickly call in notes to myself (I loved when these would go to Backpack, but that seems to be not working anymore) and now the iPhone app makes it easy to do this and sync to all of the services I have associated with the account. It definitely helps me remember things when I’m traveling or just need a quick reminder. I also hear some great things about, well, Things (which also has a desktop version). But what do I actually use, day in and day out? 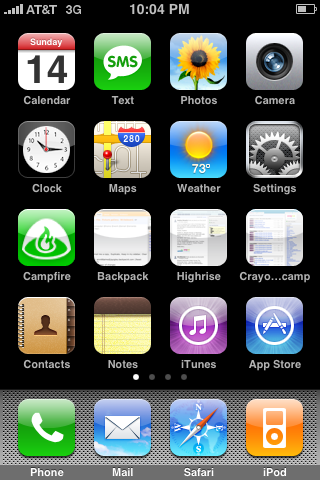 I still use the web versions of my 37signals apps – Basecamp, Backpack, Campfire (which is iPhone optimized) and Highrise – and am hoping for iPhone versions to come along soon (And so not holding my breath…). My system, which I’ll update about soon, works really well for me and I love that I can have these icons on my iPhone homepage and are a tap away. Having said that – it was the biggest disappointment that the AppStore didn’t open with any 37s apps. Just an FYI – I have given in to putting my 37signals Affiliate Banners on here (you’ll see them on the right). These are definitely product endorsements over participation in the program. I love their products – we use them at crayon, and I have had my own accounts for years. So – feel free to use these links, I just love the company.